Home » Testing Tips » Testing Tip: Let patients check the water! 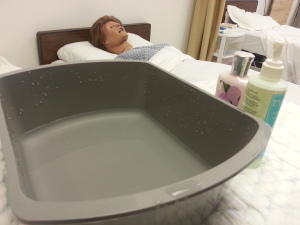 For all washing skills (hand and nail care, foot care, partial bed bath, peri-care, catheter care), you will go fill a basin with water to bring it to the bedside. You will check the water temperature with the inside of your wrist before filling the basin: it should feel warm, not hot and not cold – just warm. But just because YOU think it feels good, doesn’t mean the patient will agree! Why? I’m glad you asked! As people age, they begin to lose the protective layer of fat beneath their skin. This layer of fat also provides insulation. Without this insulation, an older person will perceive temperatures much differently than you do. Think of it like this: if you go outside in the middle of winter with long pants, boots, mittens and a coat on, the temperature won’t feel quite so bad. Sure, it will be cold, but it’s not unbearable – because you have protective layers on that hold in your body heat and block out the cold. But what if you just had on shorts and a tank top and you were outside in the middle of winter? It is going to feel really, really cold – because you have nothing to hold in your heat and block out the cold. This is what happens as we age…we begin to lose our protective layers. So cold is going to feel really, really cold. And hot water may feel really, really hot. Since you still have your layers, there is no way for you to understand how the patient is going to feel about a certain temperature – because it feels just fine to you! So EVERY time you fill a basin with water for a patient’s use, you need to offer it to them and ask them to check the water temperature. If they feel that it is too hot or too cold, then fix it! Ignoring this issue can cause serious injury or discomfort to your patient. Remember, we are there to help THEM – the patient – with things they cannot do themselves. If they could bathe themselves, would they use water they weren’t comfortable with? No. And neither would you. You would adjust the temperature until you were comfortable. You should do the same for them. It is an important component of patient rights. And it is graded on the test. Even when you are performing these skills on a manikin for the test, you must ask the “patient” (the manikin) if the water temperature is okay (the evaluator will check it to ensure that the temperature is appropriate). So, anytime you fill a basin with water for patient use…let them check the temperature before you start! I really liked this article. Sometimes we forget the little things like asking the patient and it can make a huge difference in the quality of care we provide them.